Agriculture is a critically important component of all nations’ economies. It is most certainly a vital asset contributing significantly to both the economic and physical health of the United States. Those citizens not directly engaged in the agriculture industry often give little thought to the complexities and uncertainties of the environment in which it functions. Its importance today is even more profound than it was when Thomas Jefferson boldly stated, “Those who labor in the earth are the chosen people of God, if ever he had a chosen people, whose breasts he has made his particular deposit for substantial and genuine virtue…” (Agriculture, n.d., p. 1). The label “chosen people” might be subject to debate by those engaged in other vocations or professions, but it is clear that “labor” remains a constant, albeit transformed by time and technology. The agriculture sector in the United States has had to labor ever more earnestly of late to counteract a variety of macroeconomic factors affecting the agribusiness industry. Fuel costs, weather, currency fluctuations, and increasing foreign competition have all contributed to an increasingly uncertain market landscape. Such a statement may be considered by some to run contrary to trade data, however. In a report by the Texas Agricultural Extension Service, the authors state “…greater access to international markets is crucial to the future growth and prosperity of the agricultural economy of the United States” (Benson, et al, n.d., p. 2). They make the point that since 1970 the U.S. agricultural sector has consistently produced a trade surplus each year, thereby contributing positively to the overall U.S. trade balance. Unfortunately, the agricultural export trade balance is shrinking while the overall U.S. trade deficit is growing. Table 1 illustrates that U.S. agricultural exports have grown from $50.7 billion in 2000 to $62.4 billion in 2004, a 23.0 percent increase. However, imports have increased from $38.9 billion to $52.7 billion in the same period, a 35.6 percent increase. This has produced an agricultural trade balance that has contracted from a $11.2 billion surplus in 2000 to only $9.7 billion in 2004, a 23.8 percent decrease. According to USDA forecasts, this scenario will grow even more dismal in the future. Fiscal 2005 year-end estimates are for agricultural exports to weaken slightly to $62.0 billion, while imports are expected to end the year at $57.5 billion. 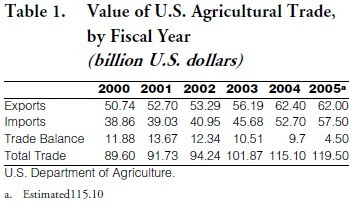 This will yield an agricultural trade balance of only $4.5 billion, less than half the 2004 number (“Value…,” n.d.). Looking further into the future, fiscal 2006 is estimated to produce agricultural exports of $63.5 billion, imports of $61.0 billion, and a surplus of only $2.5 billion. The top ten U.S. agricultural exports by commodity group are illustrated in Table 2. Soybeans were the leading export with an estimated value of approximately $9 billion for 2004. Feed grains accounted for $8.1 billion, followed by wheat, $6.6 billion; vegetables and preparations, $5.2 billion; cotton and linters, $4.5 billion; live animals and meat, $4.4 billion; fruit and preparations, $3.8 billion; poultry and products, $2.5 billion; feeds and fodders, $2.0 billion; and tree nuts, $1.9 billion (“Top Ten U.S…,” n.d.). Agricultural exports from the top 10 states amounted to 55 percent of total U.S. agricultural exports in fiscal 2004. 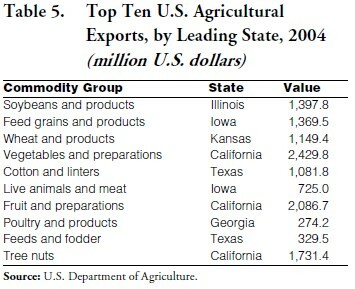 These states, ranked in descending order by value of total agricultural exports, are: California, Iowa, Illinois, Texas, Nebraska, Kansas, Minnesota, Arkansas, North Dakota, and Washington (Table 3). Expanding the list to the top 20 states by adding (in rank order) Indiana, North Carolina, Ohio, Missouri, Wisconsin, Florida, Georgia, South Dakota, Mississippi, and Pennsylvania, raises the share of total U.S. agricultural exports to 77 percent (“Top ten states…” n.d.). Immediately prior to the Cuban revolution, the United States and Cuba were engaged in significant trade. 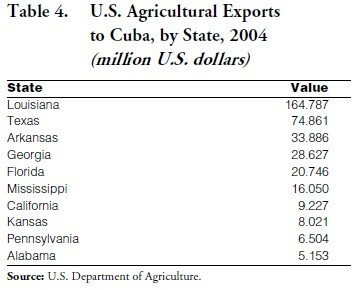 Cuba was the United States’ sixth largest export market. In 1957, U.S. exports to Cuba were valued at $617 million, or 3.0 percent of total exports. In the same year, the U.S. imported $482 million in Cuban products, 3.6 percent of total imports. The following year, in 1958, U.S. exports to Cuba dropped to $547 million, but increased to 3.1 percent of total exports to the country. During this same period, of all goods imported by Cuba at this time, the U.S. accounted for about 70 percent of the total. Of this amount approximately 25 percent consisted of agricultural commodities, such as beans, beef, dairy products, and rice. U.S. imports from Cuba were also quite strong in the period preceding Castro’s ascension to power. In 1957, $482 million in Cuban products were purchased by the U.S., or 3.6 percent of total imports. The following year, 1958, yielded an increase in both the dollar amount and percentage, with $528 million and 4.0 percent respectively. In the period immediately following Castro’s takeover, bilateral trade continued, albeit under a somewhat less stable scenario. U.S. exports to Cuba in 1959 totaled $439 million, a decline of nearly 20 percent over the previous year. As a percentage of total exports, these sales slipped to 2.5 percent. Likewise, U.S. imports from Cuba dropped to $475 million, a 10 percent decline. As a percentage of total imports the figure dropped to 3.0 percent. U.S.- Cuba relations began to falter in 1959 with the growing radicalization of the revolution. Nonetheless, in 1960 U.S. exports to Cuba amounted to $224 million, a nearly 49 percent decline. As a percentage of total exports the share dropped to 1.1 percent. Imports from Cuba remained rather robust, however, with $357 million in goods being purchased although this did represent a nearly 25 percent decline from the previous year. U.S. imports from Cuba slipped to 3.0 percent of total imports. A precipitous decline in trade between the two countries began in 1961. Total U.S. exports to Cuba amounted only to $14 million, or 0.1 percent of total U.S. exports. Likewise, the U.S. imported only about one-tenth the amount of Cuban products that year compared to the previous year: $35 million, or 0.2 percent of total imports. Within the next two years economic relations between the U.S. and Cuba virtually evaporated. By 1964 no trade was being conducted at all. In 1992, Representative Robert Torricelli (D-NJ) and Senator Bob Graham (D-FL) introduced “…a bill to promote a peaceful transition to democracy in Cuba through the application of appropriate pressures on the Cuban government and support for the Cuban people” (“Cuba-related…,” n.d., p. 3). With strong backing from his New Jersey Cuban-American constituents, Torricelli made this legislation his cause celebre. The Cuban Democracy Act, better known as the “Torricelli Bill,” was revealed to the public at a press conference on February 5, 1992 (“Tracking…,” n.d.) Indicative of the influence of the Cuban disapora was the fact that the founder and president of the Cuban American National Foundation Jorge Mas Canosa, was present at his side when Torricelli debuted his bill (“Remarks…,” 1992). The Torricelli Bill sought to extend the U.S. embargo against Cuba while, at the same time, tightening restrictions. The language of the bill as originally drafted called for (1) ending U.S. corporate subsidiary trade with Cuba; (2) the President to urge Western allies to enforce the embargo; (3) sanctions against Latin American countries trading with Cuba; (4) preventing ships stopping in Cuban ports from entering U.S. ports for a period of six months from the date of their departure from Cuba; and (5) federal funding and supplying of Cuban opposition groups. Shortly after its formal introduction, the bill was forwarded to six committees for review. In the Foreign Affairs Committee on May 21, 1992, Representative Ted Weiss (D-NY) introduced an amendment exempting medicines and medical supplies and equipment from the embargo. It passed by one vote, but when the committee reconvened a month later, Torricelli added a clause requiring that a U.S. government official accompany any such shipments of medical supplies to Cuba. Following minor revisions in committee, the bill was passed by Congress on October 15, 1992, ten months after its introduction. Only eight days later in Miami, President Bush signed the Defense Authorization Act for fiscal year 1993 which incorporated the Cuban Democracy Act. At the ceremony he commented: “…this Cuban Democracy Act strengthens our embargo. It will speed the inevitable demise of the Cuban Castro dictatorship. The legislation that I sign today reflects our determination, mine and yours, that the Cuban government will not benefit from U.S. trade or aid until the Cuban people are free” (Ibid, p. 5). On February 14, 1995, Representative Dan Burton (D-Indiana) introduced H.R. 927, a bill “to seek international sanctions against the Castro government in Cuba, to plan for support of a transition government leading to a democratically elected government in Cuba, and for other purposes” (“H.R. 927,” n.d., p. 1). A companion bill on the Senate side was introduced by Senator Jesse Helms (R-NC). The stated purpose of this bill was to facilitate the transition from Cuba’s communist form of government to that of a true democracy. The mechanism for this transition, as expressed in the language of the bill, was to deny the Cuban government access to foreign trade and investment. At the time of its introduction in the House, there was a substantial opposition to this legislation on both sides of the aisle as well as from President Clinton and Secretary of State Christopher (Groombridge, 2001). A dramatic event was soon to change opinion on this issue, however. A year from the introduction of HR 927, on February 24, 1996, at approximately 3:30 p.m., three aircraft (Cessna 337s) operated by Miami-based Hermanos al Rescate (Brothers to the Rescue) were flying a routine search and rescue mission north of the 24th parallel looking for Cuban rafters, when they were intercepted by two Cuban Air Force fighter jets. One of the Cuban fighters, a MIG-29, fired air-to-air missiles at two of the aircraft downing both and instantly killing the four occupants. The third American plane escaped the attack and safely returned to its home airfield in Opa-Locka, Florida. Outrage over this incident was swift and widespread (“Report No. 86/ 99,” 1999). Following this tragedy the Helms-Burton legislation gained “overnight” support. Only three weeks later, on March 12, 1996, President Clinton signed the legislation into law. Although there are four titles in this law, two are the primary source of ongoing controversy. The first two deal with strengthening the embargo and conditions under which the embargo could be repealed. The essence of Helms-Burton is found in Titles III and IV. Title III establishes the right of private legal action by U.S. citizens against aliens who knowingly traffic in property confiscated by the Cuban government. Title IV bars entry to the United States to corporate officers, principals, or controlling shareholders of any corporation that confiscates or traffics in said property (Reade, 1996). To date, Sherritt International of Canada and BM Group of Israel have been sanctioned by the U.S. government under Title IV. Grupo Domos of Mexico was threatened with sanctions, but their business deal with Cuba fell through (Morici, 1997; “Helms-Burton…,” 1999). Reaction to passage of Helms-Burton was widespread and largely critical. To the surprise of the Clinton administration, the American business community was particularly disapproving. Among the critics of this new law were the U.S. Chamber of Commerce, the National Association of Manufacturers, and the National Foreign Trade Council. A common sentiment was the fear of losing customers and retaliation by foreign governments against U.S. goods. Clinton responded by suspending enforcement of the Title III provisions that allowed suits to be filed against foreign investors profiting from confiscated property (“Case studies…,” n.d.). The European Union reacted by challenging Helms- Burton in the World Trade Organization (WTO). On October 28, 1996, European Union ministers passed a law prohibiting EU individuals or companies from complying with Helms-Burton (“EU counters…,” 1996). The executive branch of the EU, the European Commission, also filed a complaint with the WTO. Although the WTO lacks the power to overturn an act of the U.S. Congress, it can authorize member nations to take counteractions. Conflict with WTO principles. Member nations make mutual commitments to open their markets and investment in a rules-based trading system. These commitments cannot be waived for foreign policy reasons because most trade policy actions possess a foreign policy dimension. Possible U.S. violations of WTO commitments. The European Union claimed that the U.S. was in violation of WTO commitments. The U.S. countered by citing the option to claim the “security exception” allowed in GATT Article 21. A bad precedent. The ability of the WTO trading system to maintain open markets could be adversely impacted if the U.S. were to boycott the proceedings or reject an unfavorable finding. Loss of respect and support for U.S. leadership. U.S. foreign policy is increasingly viewed as motivated by domestic political interests and foreign financial contributions. There is scant agreement abroad to the claim that Cuba threatens the “essential security interests” of the United States. In the period following the passage of Helms-Burton, several changes in U.S. policy toward Cuba evolved. The agribusiness lobby, the U.S. Chamber of Commerce, the American Farm Bureau Federation, and other pro-trade groups increased pressure on Congress to enact legislation to facilitate trade with Cuba. Neither was the Executive branch immune from their increasing influence. President Clinton, following Pope John Paul’s visit to Cuba in January 1998, took action that approved (1) the resumption of direct flights to Cuba; (2) the resumption of cash remittances to close relatives; and (3) the facilitation of the sale of medicines, medical supplies, and equipment to Cuba. A year later the President further relaxed restrictions pertaining to Cuba most notably those relating to travel (“The rise,” n.d.). Such was the political climate that in October 1999, when Senators John Ashcroft (R-MO) and Chuck Hagel (R-NE), introduced an amendment to the Agriculture Appropriations bill that would eliminate unilateral sanctions on the sale of food and medicine worldwide. It passed by a wide margin. Because the House version of the bill had no provision pertaining to unilateral sanctions, the issue was referred to a House-Senate conference committee. In the midst of a contentious debate, the House leadership recessed the committee without a vote. A compromise proposal was then drafted by Republican leaders that dropped “the Ashcroft amendment” altogether (“Federal…,” 1999). Frustrated by what many perceived to be disregard by the administration for the spirit and intent expressed by Congress in passing the Trade Sanctions Reform and Export Enhancement Act, a bipartisan group of legislators introduced Senate Bill 328 and House Bill 719, The Agricultural Export Facilitation Act of 2005 (AEFA), on February 9, 2005. The sponsor of S. 328 was Senator Larry Craig (R-ID). His initial co-sponsors were Senators Baucus (DMT), Roberts (R-KS), Lugar (R-IN), Hagel (R-NE), Talent (R-MO), Enzi (R-WY), Chafee (R-RI), Crapo (R-ID), Thune (R-SD), Hutchison (R-TX), Murray (D-WA), Bingaman (D-NM), Lincoln (D-AR), Dorgan (D-ND), Nelson (D-NE), Johnson (D-SD), Pryor (D-AR), Landrieu (D-LA), and Harkin (DIA). This number has since grown to include Senators Brownback (R-KS), Cantwell (D-WA), Jeffords (I-VT), Collins (R-ME), Stabenow (D-MI), Cochran (R-MS), Conrad (D-ND), Bond (R-MO), Dodd (D-CT), and Leahy (D-VT) for a total of 30 sponsors. The official purpose of the bill is “to facilitate the sale of United States agricultural products to Cuba, as authorized by the Trade Sanctions Reform and Export Enhancement Act of 2000” (“S.328,” n.d.). The key elements of this bill are: (1) the clarification of Congressional intent to sell U.S. agricultural goods to Cuba by defining “cash payment in advance” to mean receipt of payment prior to the transfer of title and release of control of the goods to the seller; (2) the authority to issue OFAC general licenses for U.S. agricultural producers and port authority staff to travel to Cuba in direct support of sales or trade agreements; (3) the authority to issue direct payments to U.S. banks for such sales; (4) repeal of Section 211 of the 1999 Omnibus Appropriations Bill (H.R. 4328, passed October 19, 1998) bringing the U.S. back into compliance with the Inter-American Convention and WTO TRIPS as pertaining to U.S. registered trademarks; and (5) the streaming of visas issued to Cubans to travel to the U.S. for the purpose of inspecting agricultural products prior to shipment or to negotiate sales agreements with their U.S. counterparts (“Agricultural…,” 2005). In comments to the media, Senator Craig stated, “Today, I will not allow bureaucrats to reinterpret Congress’ original intent and obstruct already established legal trade.” Senator Baucus added, “The Agricultural Export Facilitation Act will ensure that agricultural producers… all over the country can keep the market and continue to sell their products to Cuba as they have done without incident for several years” (Bonilla, 2005, p. 3). Concurrent with the introduction of S.328 an identical bill, H.R. 719, was introduced in the House of Representatives also on February 9, 2005. The principal sponsor was Representative Jerry Moran (RKS). His initial co-sponsors were Representatives Otter (R-ID) and Flake (R-AZ). Unlike their Senate colleagues, who started with substantial backing that continued to grow steadily, Moran’s supporters have increased significantly over time. At the time this paper was written, the list of co-sponsors had grown to include the following Representatives: Terry (R-NE), Grijalva (D-AZ), Kuhl (R-NY), Kind (D-WI), Tiberi (R-OH), Boozman (R-AR), Emerson (RMO), Green (R-WI), Peterson (D-MN), Boswell (D-IA), Moore (D-KS), Shimkus (R-IL), Pickering (R-MS), Everett (R-AL), Berry (D-AR), Hinchey (D-NY), Snyder (D-AR), Thompson (D-MS), Farr (D-CA), Gordon (D-TN), LaHood (R-IL), Conyers (D-MI), Allen (D-ME), Price (D-NC), Pastor (DAZ), Costello (D-IL), Ross (D-AR), Johnson (R-IL), and Towns (D-NY) (“H.R. 719,” n.d.). Reaction to the introduction of these two bills was swift and strong. Bob Stallman, President of the American Farm Bureau Federation, came out clearly in support. In a statement to the media he said, “We applaud these changes which would clarify Congress’ intent when it enacted trade sanctions reforms in 2000 and streamline the procedure that allows U.S. farmers and ranchers to export their products to Cuba” (“FB Supports…,” 2005). In expressing support for these bills, Indiana Farm Bureau President Don Villwock said, “I know personally from my trip to Cuba last year that the Cuban people want and need U.S. food products, many of which can be exported from Indiana” (“FB Supports…,” 2005). Less than three months following his inauguration, President Bush, on the occasion of Cuban Independence Day in May 2001, clearly announced his administration’s position toward Cuba. He said, “My administration will oppose any attempt to weaken sanctions against Cuba’s government … until this regime frees its political prisoners, holds democratic, free elections, and allows for free speech” (“Remarks…,” 2001, p. 15). Two months later, he directed the Treasury Department to strengthen the enforcement capabilities of the Office of Foreign Assets Control (“President’s…,” 2001). The following year, President Bush debuted his new Cuba initiative designed to improve the lives of the Cuban people. This plan had four major elements: (1) utilizing U.S. non-governmental organizations (NGOs) and religious groups to expand humanitarian assistance; (2) providing direct assistance to the Cuban people through NGOs; (3) resumption of direct mail service between the U.S. and Cuba; and (4) creation of scholarships for Cuban students and scholars in the United States (“President,” 2002). Three additional initiatives were announced on October 10, 2003: (1) stricter enforcement of inspections of both travelers and shipments between the U.S. and Cuba; (2) expansion and improvement of the Cuban immigration program; and (3) creation of the Commission for Assistance to a Free Cuba. Secretary of State Colin Powell was selected to chair this commission (“Fact…,” 2003). Bush stated that the commission would be established “…to plan for the happy day when Castro’s regime is no more and democracy comes to the island” (“Fact…,” 2003, p. 1) The President identified the following objectives of U.S. policy toward Cuba: “bring an end to the ruthless and brutal dictatorship; assist the Cuban people in a transition to representative democracy; and assist the Cuban people in establishing a free market economy.” In pursuit of these objectives Bush gave the commission a mandate to identify: “Additional measures to help the Cuban people bring to an end the dictatorship; and elements of a plan for agile, effective, and decisive assistance to a post-dictatorship Cuba” (“Fact…,” 2004, pp. 1, 2). Furthermore, he reiterated his intention to maintain and enforce sanctions and the ban on travel to Cuba. On February 26, 2004, President Bush directed the Department of Homeland Security to step up its patrols of the waters between Cuba and the United States. The purpose was not to enhance the search and rescue of Cuban rafters, but to put a stop to American pleasure boat traffic from Florida to Cuba (“Expanding…,” 2004). On May 6, 2004, the President publicly endorsed the recommendations in the report of the Commission for Assistance to a Free Cuba (“Remarks…,” 2004). The report was organized into six chapters: (1) Hastening Cuba’s Transition; (2) Meeting Basic Human Needs in the Areas of Health, Education, Housing, and Human Services; (3) Establishing Democratic Institutions, Respect for Human Rights, Rule of Law, and National Justice and Reconciliation; (4) Establishing the Core Institutions of a Free Economy; (5) Modernizing Infrastructure; and (6) Addressing Environmental Degradation. On June 16, 2004 the Office of Foreign Assets Control announced profound changes to the Cuban Assets Control Regulations, 31 C.F.R. part 515, in order to implement the recommendations in the commission report. Among some of the most significant were the following: (1) The elimination of “fully- hosted travel” defined as “…travel to, from, or within Cuba for which all costs an fees either are paid for a third-country national who is not subject to U.S. jurisdiction or are covered or waived by Cuba or a national of Cuba”; (2) a prohibition on the receipt of foods or services in Cuba when those goods or services are provided free-of-charge regardless of the source; (3) prohibition on the importation of any merchandise purchased or acquired in Cuba; (4) the limitation on the amount of accompanied baggage per traveler to 44 pounds; (5) travel to visit relatives in Cuba limited to members of a person’s immediate family once per three-year period not to exceed 14 days in duration, per diem limited to $50; (6) attendance at professional meetings restricted slightly; (7) institutional licenses for activities in Cuba reduced from two years duration to one; students must be enrolled in a degree program at the licensed institution; only full-time, permanent employees of the licensed institution are permitted to travel under the license; structured educational programs must be at least 10 weeks in duration and directly related to the students’ degree program; (8) participation in international sports events, clinics, or workshops formerly permitted under a general license now require a specific license; (9) quarterly remittances to Cuban nationals may be sent only to immediate family members and the total amount remitted reduced from $3,000 to $300; (10) NGO remittances further restricted under specific licensing; and (11) remittancerelated transactions by banks and other depository institutions involving forwarding of family remittances formerly regulated under a general license now requires a specific license (“Recent…,” 2004). OFAC further amended the Cuban Assets Control Regulations on February 22, 2005. This was an attempt to clarify the term “payment of cash in advance” within the context of the authorized export of U.S. agricultural products to Cuba. It was defined as “…payment is received by the seller or the seller’s agent prior to shipment of the goods from the U.S. port at which they are loaded” (“Recent…,” 2005, p. 1). This action was not well received by the agribusiness community as well as a number of vocal legislators. The Virginia Agribusiness Council stated, “The Council opposes the regulations by the Treasury Department’s Office of Foreign Assets Control… These regulations will disrupt the shipment of U.S. farm products…The Council supports the Agricultural Export Facilitation Act of 2005” (“Critical…,” 2005, p. 1). Stuart Proctor, President of the USA Rice Federation said, “The OFAC ‘clarification’ is an obvious effort by the administration to further restrict trade with Cuba. Trade sanctions imposed in 1961 have already cost American rice farmers an estimated. $3 billion in lost sales” (“Farm…,” 2005, p. 3). On March 16, 2005, in testimony before the House Agriculture Committee, USA Rice Federation spokesperson Dennis Delaughter encouraged Congress to (1) reverse the OFAC final rule; (2) allow all existing contracts to be honored; (3) pass H.R. 719; and (4) ensure compliance with TSREEA of 2000. He further commented, “We are particularly concerned that we risk losing a potential $100 million market that is so close to our shores” (“OFAC…,” 2005, p. 5). In a brief letter dated July 29, 2005, addressed to Senators Grassley (R-IA) and Baucus (D-MT), Stuart Levey, Under Secretary of the Treasury Department, further stated that “This interpretation allows a U.S. seller to ship goods once the seller or the seller’s agent receives payment…the seller’s agent may be a third country financial institution…” (“Letter, 2005,” p. 1). Earlier in this paper it was reported that total exports of U.S. agricultural products in 2004 amounted to $62.4 billion. 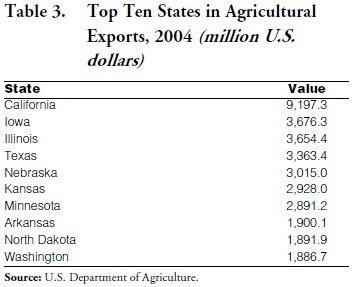 Table 4 illustrates the value of such exports by state, for the top ten agricultural exporting states. California is in undisputed first place with nearly $9.2 billion in agricultural exports last year, followed by Iowa and Illinois, with almost $3.7 billion, Texas with about $3.4 billion, and so forth. However, when agricultural exports to Cuba are isolated, the rank order changes significantly. 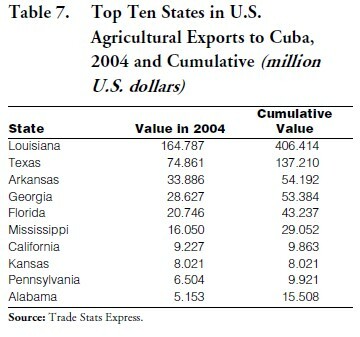 Louisiana, with nearly $165 million in agricultural sales to Cuba last year dominates the top of the list. In second place is Texas with almost $75 million followed by Arkansas with slightly under $34 million in sales. This list is largely populated by Gulf states. 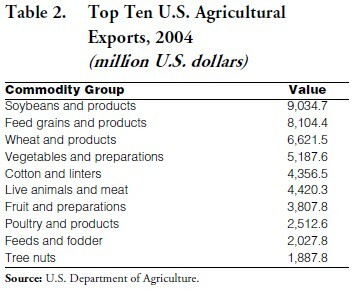 When the top U.S. agricultural exports (see Table 2) are interpreted in the context of the state which leads in the export of each respective commodity group some interesting patterns emerge. Table 5 reveals that Illinois leads in the export of soybeans with nearly $1.4 billion in sales in 2004. Following a close second is Iowa with feed grain sales of an almost identical figure. Although vegetables rank fourth overall in sales as a commodity group, California claims the highest dollar value in 2004 exports at $2.4 billion. By changing our focus on agricultural exports to Cuba, some distinct data rise to the surface. Table 6 shows the top ten U.S. exports to Cuba over the past four years—the period during which TSREEA has been in effect. 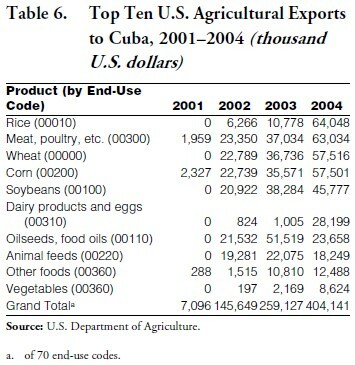 Using Census Bureau end use codes it is evident that rice is most in demand by Cuba with 2004 sales of $64 million. Following closely is meat and poultry sales of $63 million. Grains and beans are also popular with robust sales as well. Yet another perspective on this data reveals the true impact of TSREEA, and suggests the potential and exponentially greater impact yet to be realized if AEFA were to become law. Table 7 illustrates the sales to Cuba for 2004 and the total to date for the top ten states (of 38) that have been exporting to Cuba. Louisiana is by far the leader with nearly $165 million in 2004 sales and over $400 million in total sales through 2004. A distant, but respectable, second place goes to Texas with almost $75 million in 2004 exports and $137 total sales to date. It is noteworthy that of the top ten, seven are Gulf coast/ southern states. These data lend substantial credibility to the claim by researchers at the Center for Economic Forecasting and Analysis at Florida State University that “…loosening of U.S. trade sanctions would generate significant business opportunities for the U.S. economy.” Their very thorough study suggests that continuing the embargo against Cuba costs the U.S. from $1.8 billion to $12.7 billion annually (Lynch et al., 2004, p. 3) Even if the embargo were to continue for the foreseeable future, legal trade with Cuba has had a beneficial impact on the U.S. economy. According to the USDA’s Economic Research Service, every dollar of exports creates another $1.47 in supporting activities to process, package, ship, and finance agricultural products. (“Importance…,” 2002) If the Agricultural Export Facilitation Act of 2005 becomes law, thereby increasing sales to Cuba, then this “multiplier effect” will further benefit the U.S. economy. Given the highly charged emotions that permeate the major constituencies that would be affected by the passage of this legislation it will be interesting, to say the least, to monitor this important issue in the months to come.